The milestone I mention is this one. 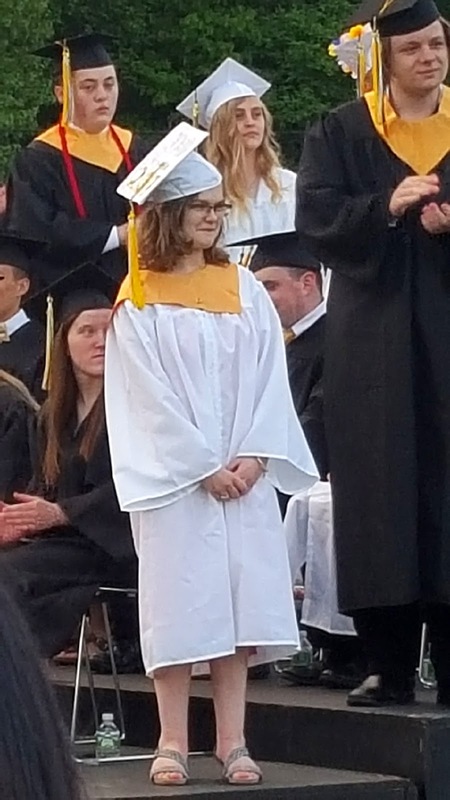 Julia graduated from high school a couple weeks ago. I didn't realize what a flood of emotions I would have as the day approached. Julia has been taking part in the local school system since she was three years old because of her special needs due to congenital hydrocephalus - a brain injury which was present at birth. It has been a long journey that is now over. The special ed coordinators and directors - Gordon Parker, Sharon Jones, Deb Lanou, Claire Brennan, and Chris Maguire - were there behind Julia - looking for the right opportunities and help that was available and what would benefit her the most. I have always felt that the Special Education Department had Julia's best interest at heart - and I want to thank them for all that they did for her and fought for her to get the best public education in our rural school district. When Julia was 6 she was diagnosed with Type 1 Diabetes. Then began her several times a day interaction and close relationships with the school nurses. Mary Lavalley, Vickie Rowe, Carla Simpson and substitute nurses Sharon Fontaine and Lonnie were all there for Julia as she learned to navigate her chronic illness. Through the finger sticks, to the low and high blood sugars, through learning to give herself injections, to the intense learning curve of insulin pump therapy, the school nurses helped and coached Julia through it all with kindness, cheerleading and mental support. Other people have been so kind and supportive along the way for Julia. Guidance counselor Matt Soycher has given her confidence that she can continue your education at the local community college. Athletic Director Gina Johnson has cheerleaded for Julia since she was an infant and offered her a modified personal fitness class which kept her safe from flying balls and fast moving kids. 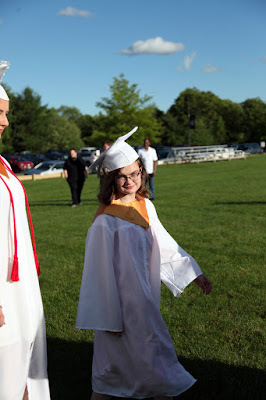 Para professional Colleen Kennedy has helped Julia with her confidence since she attended a Summer School Program at three and then again during middle and high school these past 6 years. Kevin Mortenson and Kim Godfrey helped her with her assignments in the Learning Center. Teacher Barb Killeen encouraged Julia to be the historian in the National Honor Society and was a great influence for her as she learned to work with little kids in the Child Development Class and Panther PreSchool. Mr. "P" became a favorite teacher these past couple years as she took Advanced Woodshop and made a beautiful pieced quilt design table, sheep cutting board, wood platter, a stool, striped platter and carved spoon. It is so great to see how proud Julia is of her projects that she made with her own hands, wood, and power equipment, along with help from Paraprofessionals Ruth Hanlon and Gail Streeter. Kathy Abbott, Business, Yearbook and Accounting Teacher nurtured Julia's special traits and gave her confidence and guidance. English Teach Amy Brown welcomed Julia into her classroom at lunch time for conversation. I am sure I missed some teachers that helped Julia get through and to all of you, we are very thankful for such great educators. The evening before graduation, I watched senior after senior get academic, sports and assorted awards. I thought back on Julia's journey which has been so different from the other kids who were graduating as has our parental journey. She was given an award for students who have struggled with disabilities from the Owen Clarke Foundation. As she made her way back to her seat, I heard adults behind us snicker as Julia slowly descended the stairs with her cautious movement, taking the stairs I step at a time, catching the sleeve of her gown on the railing. I couldn't help but turn and leer at them. Did they realize how hard this kid had worked to get through high school - to face her problems that life has dealt her? Did they realize that not all kids are superstars, athletic stars, geniuses? This kid, my kid, deserved every award out there but that is not what our society rewards. I left the ceremony with lots to think about. School has not been easy for Julia. Because of her disability, she hasn't fit in with the other kids. It really hasn't bothered her much. She has always preferred adults to kids and has always considered adults her friends. I thought back to my days in high school - to the fun I had being in the high school band, the plays, the overnight band trips, welcoming foreign exchange students into our home, learning to sew with Mrs. Airola, hanging out with my friends. Julia's school experience has been so different than most kids. It wasn't bad - just different. 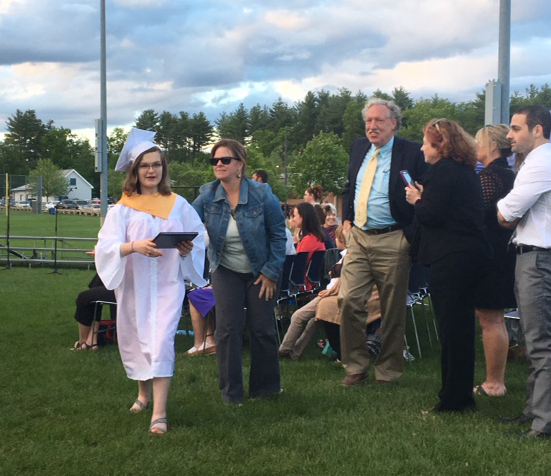 The next evening at the graduation ceremony, Julia was paired with the President of the National Honor Society to walk down the aisle. She got on the stage okay but why did they put her on the third level? 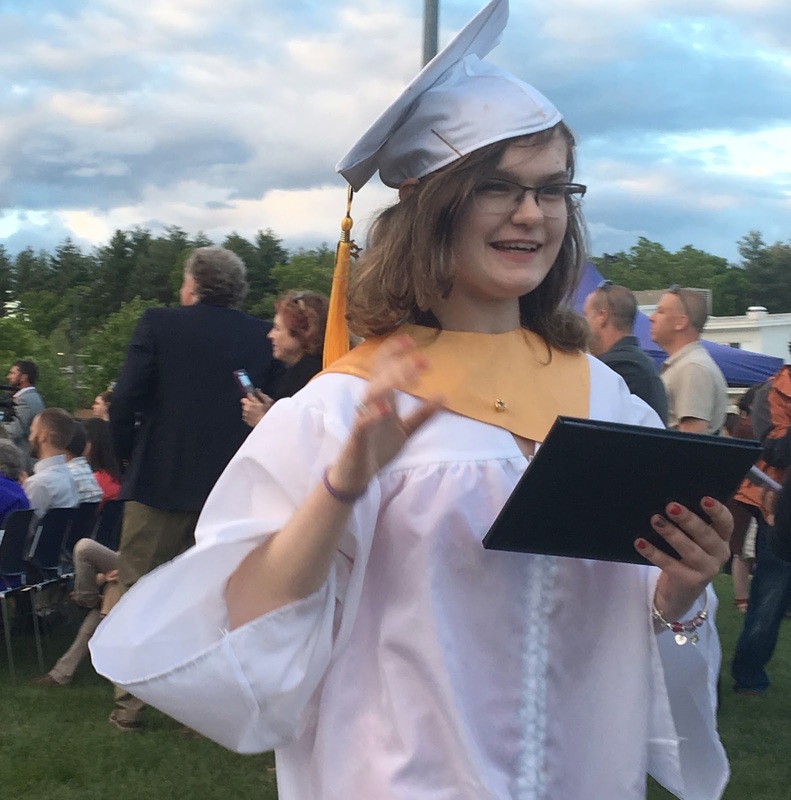 Elizabeth Sweeney gave the Salutatorian speech and kindly mentioned Julia by name and why she would miss chatting with her as all the kids go their separate ways. As Julia waited to get her diploma, her dad and I held our breath hoping that she wouldn't fall down the stairs. Her name was called and it is all a blur to me. I yelled and cheered for her, successfully holding back my tears. Her classmates stood up and gave her a Standing Ovation which was very sweet. I am a first born child - number one of five. Like many first borns, I am Type A - achieving, producing, making, doing has always been part of my modus operandi. As I have navigated the waters of parenthood with a special needs child, it has not always been easy or natural for me. I have had to learn to slow down, have patience, see things differently and from other points of view, try to understand the physical, emotional, and educational needs of my child. I do not always do this well. I have to catch myself - bite my tongue and take a deep breath. I no longer see myself as Type A - I have changed because of Julia and because of living on a farm where there is no control over nature and what she throws at you. I have sat in many an IEP (individual education plan) meeting, only to leave in tears, hoping that my child was getting what she needed, realizing that she would not have the childhood or life I have had. My sister Laurie has always been my go-to for help as she too has a child with special needs. Her support over the years has been so helpful for our family and for that I will always be grateful and thankful. As we pass this very big milestone in Julia's life and our family's life, we are now onto the next great adventure of navigating what is next for her. It isn't going to be easy as all the support that we have known and that was available through the public school system is done. Support will be harder to find. Will she be able to hold down a job? Will she learn to drive a car? Will she be able to get through a college course? So many questions and possibilities. As I look at the current political climate I fear greatly for Julia's future and for others with disabilities and health problems. I hope that there will still be help out there for people like Julia - that the politicians will continue to fund the programs for those who cannot take care of themselves without some kind of financial aid. Her Dad and I will not be around forever and our biggest goal now is to have her be able to support herself somehow, some way. It is a big task to ask of an 18 year old - even one without issues. We don't know what is next and the chapter will slowly unfold but for now, I am just so proud of Julia and what she has accomplished with what life has thrown at her. And so thankful for all of the educators who have helped her along the way. p.s. I'm not looking for pity by writing this - just sharing our experiences with a special needs child. Published with permission from Julia. What a touching tribute to your daughter, and all those wonderful people in her life! I wish her well in her future and have faith she will find her way!! Julie is so lucky to have you and Mark as her parents. She is a lovely and special person and I am sorry I won't make it to the farm this summer to see you all! Congratulations! Well said Kristin! Julia is well adjusted because of you & her dad & all her teachers & friends. You have not had it easy but it hasn't stopped either one of you! We have a special needs grandson & it's been hard to watch what he has been through. Best of luck to Julia & congratulations! That was absolutely lovely. So very sweet. Congratulations to Julia on her graduation! I enjoyed reading her story and how hard she has worked to get to this point! I commend all the teachers and people who worked with her all these years to support and encourage her, they sound like wonderful people. I love the table she made! it is so beautiful. I wish her well moving onto college! Dear Kristin, I can relate so well to your gratitude for the support system in your public schools. It's a huge amount of work for parents to learn about and navigate (and advocate for! ), but you have clearly done an excellent job, making it possible for Julia to get a good education. Many congratulations to Julia for all her hard work as well! Hoping our kids can become independent and self-sustaining once we are no longer there to support and guide them is constantly in my thoughts as well. I hope you all have a good summer and that Julia can explore what her next chapter will be! Fortunately, there are good programs in college that offer a lot of support - we can only hope that the current administration will continue to support them. I had the pleasure of meeting Julia last year at your open house. She is a charming, well-spoken and pleasant young lady who humored my questions about life on a farm. Congratulations to her as she moves on to the next phase of her life. I too have a special needs daughter. And I also fear for the future of the most vulnerable in our society. I pray that the people in Washington remember that they represent all of us and find a way to care for the neediest. Julia has been lucky to have an army of caring people working with her. (Lead mostly by her mom and dad). She's a lovely young lady. Be proud of your girl! I feel as if I've cheered for Julia over the years through your posts, website,books, patterns, etc. --Always held space for you and Julia. I loved seeing this post and share your fear with the current political climate, without of course the added weight of your daughter's future on the line. You and your husband have done so wonderfully, you're the definition of strength, honesty, plugging ahead and frankly and perhaps frequently-- sheer ballsiness! I hug you all. I congratulate Julia and know that with the lessons ingrained, she can't help but move into a future that is for her, happy and fulfilling! Sure do wish I could attend a weekend with y'all at the farm! What a beautiful post (sniff, sniff, as a wipe away a few tears). What a wonderful job you and your husband have done parenting her, loving her and navigating the educational system. As a teacher/librarian I really appreciate your kind words about all of the adults that have nurtured her and guided her on her journey. Enjoy your beautiful daughter as y ou move into the next stage of her educational journey. Thank you so much for sharing Julia's story. It takes love and commitment to get any child through the maze of school. It takes some really extraordinary people to get a special child there. You are so fortunate to have had so many good people on your team. My autistic grandchild is on the path now and it has been very difficult for him. The one thing I hold on to is that he has love and support, and his parents are rallying people to his corner. No pity from me, Kristin...just heaps of praise!!! Julia's story is amazing. It is always scary when a special needs child moves on to the next step in their journey. Does your school system have a program for children like Julia that helps to teach them additional life skills? I know our school system does and that the kids can stay in the program until they are 21. Beautifully said, Kristin. Thanks for sharing Julia's amazing story. Thank you for sharing your life and Julia with us. Congratulations to you all for all you have accomplished!!! Julia is and always will be very special and I know she will be fine. You have done a wonderful job and are so very talented as well as supportive. Good luck for a successful future, whatever that may be. Such a good post. Congratulations to Julia and you and your husband too. Parenting really does take a village. Love that photo of Julia at the end! Kristin, I can't believe your beautiful girl is all grown up! She's just lovely and I can tell from her smile, that she will look for the fun and wonder in her life. What a journey it has been and will be! Congratulations all on a very big and happy milestone! What a beautiful tribute to your daughter. Thank you so much for sharing this with us, Kristen. Congratulations Julia on your graduation! So. NO WORRIES, MOM! - You've done GOOD! I just wish that I could've been there to CELEBRATE with all of you! Anyhoo, give Her a BIG "AUNTIE"-*HUG* for me! Congratulations to you and Mark and Julia. And thank you for so beautifully expressing what it looks like when social support systems work. As others have said, I too have watched Julia progress through the years and to see this is so heartwarming. The three of you are such an inspiration and should be very proud of yourselves. As to the people snickering at Julia, the very lowest of the low. I don't think I could have reacted as politely as you did! With all best wishes from one Julia to another, much much younger one, who is already a superstar. Do not fear. You have prepared her well for whatever life she leads. Time now to sit back and see how her life unfolds and congratulate the "team" for getting her there. Things will turn out just fine. You have done a great job and you need to believe that. Rejoice! Peace and blessings. Thank you, Kristin, for sharing your parenting journey. As the mother of two children with special need, I appreciate it more than you can know. It is amazing to me how our children change us. Like you, I am a different person because of parenting my children. Congratulations to Julia. She is beautiful and appears to be brimming with confidence. All the best to you and your lovely family! Thank you for posting this Kristin. Julia is lucky to have you always advocating for her. I have enjoyed watching her grow through your blog and I can't believe she is already a graduate!! Congratulations! Your post was very moving. In spite of the challenges Julia has had, you've all given her an excellent foundation for getting the help she needs in her journey to independent living. Congratulations, Julia! You have such determination in your eyes that I know you will be a success going forward. You've written a beuatiful tribute not only to Julia but to all of the teachers who helped her to transform her life. They along with you and your husband guided her but she is the one who did the work. This speaks to her inner core and her ability and dedication to be all that she has the potential to become. The last photo you posted of her, I think, reveals a bit of her inner beauty as well as her physical beauty. You and your husband can be justifiably proud of her. I'm happy for Julia that she received recognition of her hard work and dedication. Congratulations to you family for all that you've accomplished together. Isn't love an amazing thing? PS Julia has certainly inherited your creativity! Beautiful pieces she created. Thank you Kristin! I have so benefited from your sharing your family's journey. Without understanding without empathy without kindness, it is a bleak world. I have followed your blog for a number of years now and have become so attached to you and your family. Julia has become a lovely and ,obviously, talented young lady. She always has the sweetest expression on her face. No wonder all her classmates stood up for her! 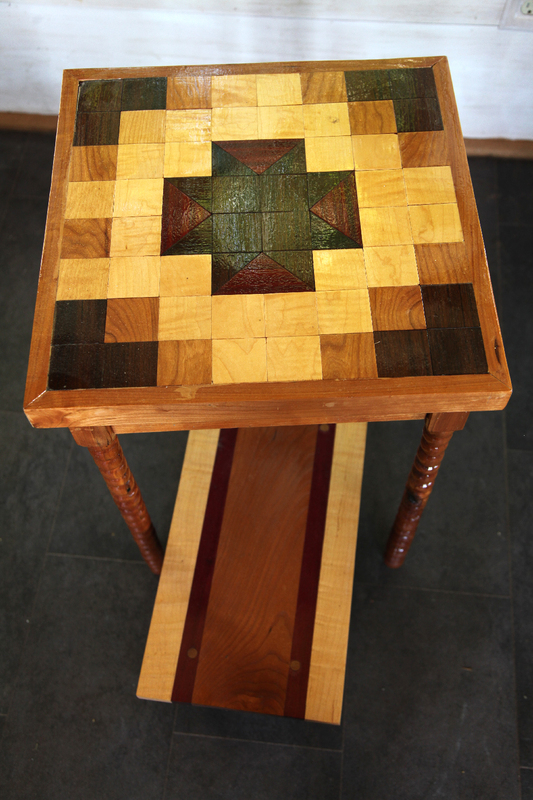 By the way, her woodworking is exceptional. She may well become an artist like you. The education system has come very far since the passage of Federal law 94-172. It has opened a lot of doors to special needs kids who could mainstream. I'm so glad it has worked out for Julia. However, she was so lucky to have advocates like you and your husband to see she did get all the help available. S for post high school, won't she be eligible for benefits until she is 21 or has that changed? CONGRATULATIONS TO JULIA AND TO HER WONDERFUL PARENTS!!!! Happy birthday Aimee. Hope the new little one comes soon! All the best to a wonderful Cat Farmer & so much more !! I loVed reading how you cared for the Cat Families and the lambs on the farm over the years. You are very talented at woodworking. Your Mom & family have always been inspiring to me, I wish you all a happy Summer. And this is what is RIGHT about American education. The photo of you in the pink sweater is gorgeous !! Julia is a very beautiful, clever girl, a credit to both you and Mark and an inspiration to us all. Congratulations Julia! I remember meeting her (and you) many years ago at a very small local festival in MA that I had read about and came up from CT to see. I also came to you open house last year. Time does fly. Let her know that her woodworking projects are gorgeous. I'm sure having you advocating for her and having a school system that really works to help the special needs children helped her become the sweet girl that she is today. Best of Luck to Julia in whatever she decides to do next. Congratulations to Julia and to you and her dad. 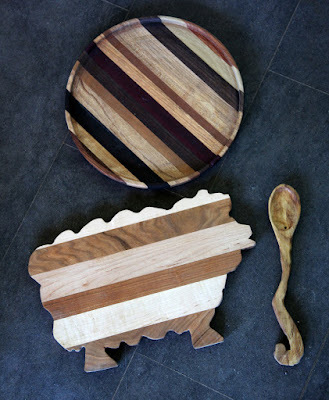 She seems like such a sweet young lady and she is such a talented woodworker! 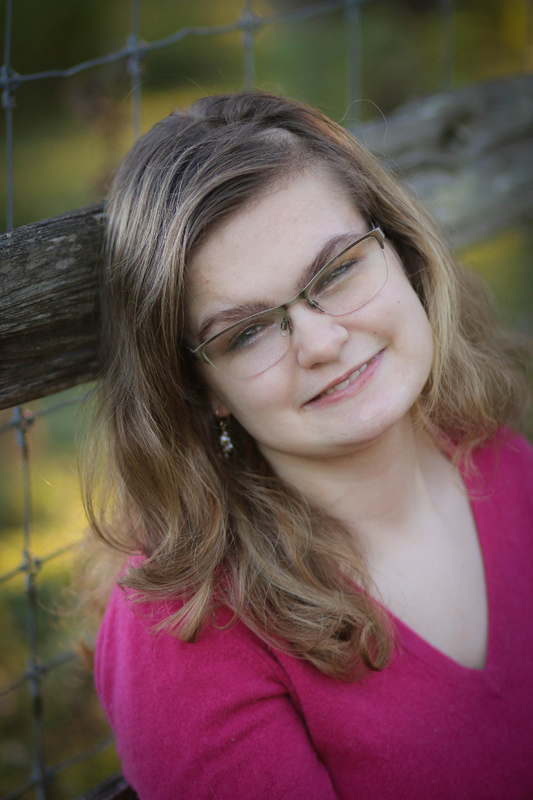 No high school graduate these days can transition into adulthood without many helping hands, but she is well on her way. I have no doubt she will have many opportunities to share her gifts with the world and to find her way in it. As for the people snickering or mocking, not only are they pond scum completely lacking in empathy, but apparently lack the intelligence to realize that any of us, at any moment, can suffer a health problem and lose abilities. I hope they did not mar your wonderful day. Mazel Tov! Your post was indeed a beautiful tribute to Julia and the people who brought her to this day. I read it with tears in my eyes for all of us who don't fit into the little boxes our society provides. G-d bless you and Mark and may He guide you as you shepherd Julia into adulthood. Congratulations to Julia! Kudos to you, your husband, and everyone for being a part of Julia's life. Recognizing the beauty and dignity of your family... Thank you for sharing.